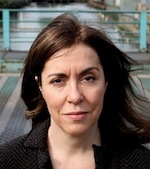 Catherine Barnett is the author of two collections of poetry, Into Perfect Spheres Such Holes Are Pierced (Alice James, 2004) and The Game of Boxes (Graywolf, 2012). She has received a Guggenheim Fellowship, a Whiting Writers’ Award, the Glasgow Prize for Emerging Writers, and a Pushcart Prize. She works as an independent editor and teaches at Barnard, The New School, NYU, and Poets House. If only they wouldn’t leave us so alone.